As someone deeply committed to public service, I want to contribute and make a meaningful difference to my community. Engaging with the citizens of Kelowna over the past three years has greatly enriched my life and I would like to continue to serve my community to strengthen public education. As a parent, with a child enrolled in the public education system, I appreciate the relationships that sustain an effective school system. The critical relationships that exist between parents, teachers, staff, Trustees, and the community need to be fostered and respectful dialogue encouraged. I am seeking your support to continue to serve our community for another term as your School Trustee on the Central Okanagan Board of Education. My unique professional background in education management, business, politics, and not-for-profit organizations offers an informed and balanced perspective to address the important opportunities and challenges that face public education in British Columbia. Quality education is the foundation of a resilient and prosperous society. The next generation will assume their place as leaders and responsible, productive citizens based on the excellent K-12 education they receive today. Our children and grandchildren will be enabled or constrained in their efforts to shape their future by the decisions we make today. These are not small issues nor small responsibilities. If Trustees make good decisions today, current and future students will be able to explore, discover, and expand their minds and experiences. This will open windows of opportunity for their future – whether it is entering the workforce, pursuing higher education at a university, college or trade school, or embarking on world adventures. 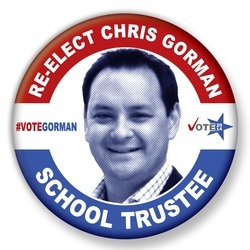 I would like your support to continue to address these issues as your School Trustee on November 15th. Please explore my website to learn more about my candidacy. If you have any questions or comments, please do not hesitate to contact me by email at chris@votegorman.ca or by phone at 250.575.2731.